Get your Big Lift book! 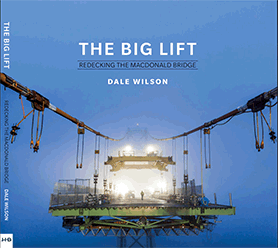 Halifax Harbour Bridges is pleased to present a hard cover book capturing all the details of Macdonald Bridge suspended spans deck replacement project, also known as the Big LIft. It is available for sale in the MACPASS customer service centre at 471 Princess Margaret Blvd in Dartmouth from 8:30am – 5:30pm Monday to Friday for $10 including taxes. Or you can call 902 463 3100.